We are delighted to announce that ASL CEO, Dr. John McKeon, was invited as a guest speaker at the International Sanitary Supplies Association (ISSA) Show North America 2018. The ISSA show gathers the entire professional cleaning industry to network and discuss innovation and solutions for the challenges and opportunities facing the professional cleaning industry. This year event features some outstanding keynote speakers such as David Goggins, former Navy SEAL, Darren Hardy, former published of Success magazine and best-selling author as well as former U.S. President George W. Bush. Alongside with these great speakers, Dr. McKeon has been invited to deliver an educational presentation on the importance of good indoor air quality, and the challenges in controlling exposure to irritants, dust and allergens in facilities and institutes, particularly for those suffering from asthma and allergies. As part of his presentation, Dr. McKeon gave great insights on the asthma & allergy friendly® Certification, the rigorous scientific testing behind the Certification Mark. Dr. McKeon talked about the innovation and Research & Development journey that Sanitaire, Bissell, have taken to obtain the asthma & allergy friendly® Certification Mark for their professional vacuum cleaner the EON™ ALLERGEN. This year the Sanitaire EON ALLERGEN came through ASL’s strict scientific standards to become the first commercial vacuum to be CERTIFIED asthma & allergy friendly®. The Certification demonstrates Sanitaire’s commitment to a healthier environment as well as the well-being of building occupants. “I’m delighted to have the opportunity to contribute to the ISSA show and educate the sector on the importance of improving our indoor air quality. The Sanitaire EON Allergen are a fantastic example of a company taking on the challenge of improving indoor air quality to benefit the health of a buildings occupants and the sensitive individuals in our communities. 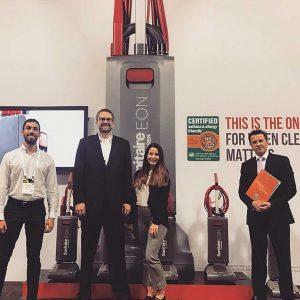 Healthy air and smart buildings are enormous growing trends and to see the facilities industry embracing this in a B2B2C format demonstrates how Bissel are taking a leadership position in their field.” Said Dr. John McKeon.